His name is Jack Sparrow, a Captain if you please, and he may or may not be the worst pirate the human race has ever seen. 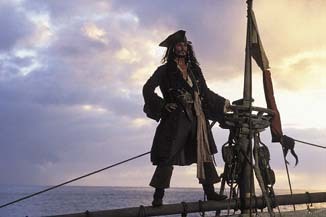 What he certainly proves to be during the course of Pirates of the Caribbean: The Curse of the Black Pearl is one of the most entertaining fluff characters in recent memory. Due largely to his unmistakable, irresistible charisma, the movie itself will charm the pants off of you just as surely as if you had spent an evening swimming in Jack Daniels at a local night club. The film itself is delightfully unpretentious as it tells the story of a cast of characters twice pulled together by fate in order to witness the birth and later the potential removal of a curse. The source of damnation is a few of the 882 pieces of Aztec gold once belonging to explorer Hernando Cortez. A group of particularly shady pirates have made the mistake of taking some of his booty for their own (but not in the singles bar way referenced above). Removing the golden treasure of Cortez from its proper resting place on La Isla de la Muerte should come with a warning label of "Caution: may cause skeletonization," as the brazen buccaneers have discovered. The horror of their condition is that none of their base human compulsions (lust, hunger or thirst) may ever be satisfied. To live the curse, they are doomed to search the seven seas in order to re-acquire all of the pieces of gold they had once "liberated" from the island's treasure chest. This brings the tortured marauders into conflict with all of our heroes. Will Turner (played by Orlando Bloom, whose appearance here indicates he is auditioning for the role of Dylan Walsh on Beverly Hills 90210) is saved by his father, Bootstrap Turner, a member of the dread pirate crew. He is sent to safety by being put on a raft that encounters a ship from the British navy. Coincidentally, the English vessel somewhat inexplicably has too-young-to-be-a-sailor Elizabeth Swann on it. Instantly drawn to the comatose boy, she notices the unusual golden necklace in his hand and takes it as a keepsake of their first meeting. Later, when the pirates return to pillage and plunder their village in an attempt to regain the piece of Cortez's gold, they wind up kidnapping Elizabeth and thereby insuring that dashing young Will follows them in order to free her from captivity. Hey, I never said the plot was original. Honestly, the movie is such a treat to watch that it seems impolite to the point of rudeness for me to dryly note that the entire basis for the film could have been avoided. Had the pirates simply explained the situation, in the interest of protecting the world from skeletal pirates, Will and Elizabeth would have been obliged to help. But what fun would that have been? The story progresses a few years with Elizabeth, now of proper marrying age, beginning to receive the attentions of recently promoted Admiral Norrington. Played by Mr. Lesbian Spank Inferno, Jack Davenport (apologies to North American readers as you won’t understand the Coupling reference for another six months), this surprisingly three dimensional character is in the early stages of asking Governor Weatherby Swann for his daughter’s hand in marriage but all parties involved can’t help but notice her natural affinity for the fledgling blacksmith-in-training she once rescued. All of this is largely irrelevant to the success of the movie, though, as the whole thing feels quite generic right up until the moment when Johnny Depp arrives on the scene as Jack Sparrow. I would like to be the one reviewer who does not refer to Sparrow as a dashing swashbuckler but I am going to fail completely in that regard. Sparrow’s first appearance is a defining moment as he semi-smoothly abandons a sinking ship (nice job, Captain! ), bribes the dock attendant and then robs the same man's purse. Playing the character flamboyant to the point of fey, Depp has finally embraced metrosexuality and become the poster child replacement for David Beckham here. His ambiguous femininity plays off as an open invitation for the vampire Lestat to cross movie genres, but it’s done with such delightful aplomb that even the most homophobic of men will still find themselves drawn to the character. Even more impressive is his erstwhile masculinity when pirate successes of old are discussed. His dizzying series of tales of former wrong-doing demonstrate a combination of pride and nonchalance I find quite refreshing. Truly, it is his movie, and Depp is more than up to the task. He had our entire audience entranced by his accidental, largely incompetent heroics. What is most noteworthy about Pirates of the Caribbean: Curse of the Black Pearl is how fleshed out almost all of the characters are. Even the two duos utilized exclusively for comic relief, Pintel & Ragetti and Murtogg & Mullroy, are used quite consistently and given an unusual amount of subtext. In fact, excluding Jonathan “I’m just here to quietly pick up a paycheck” Pryce as the Governor, we come to know all that we would ever want to know about all parties involved. And even in the case of Pryce, he is demonstrated to be a doting father, though his work as a patrician coward is a bit too overcooked for my tastes. Geoffrey Rush stands in stark opposition to Pryce as his performance as Barbossa, the pirate leader, is marvelously over-the-top. He appears to relish the opportunity to play the villain in a family film, and his enthusiasm infuses the character with vigor. The denouement involving Rush and Depp is one of the most enjoyable of the year because of both men’s Celebration of the Silly Fun. One more positive in The Curse of the Black Pearl is the CGI. As I mentioned recently in a review of The Hulk, the subject of how much CGI is too much has become one of the trickiest areas for a production. It’s a similar difficulty being faced in the videogame industry with cut scenes. Those have quickly gone from being inventive ways to advance plot to becoming an annoying method of interrupting the action with extended segments where a gamer has no input on the action. The result is that the player grows all too aware of how artificial his environment is, and that situation perfectly summarizes what sunk The Hulk. Pirates of the Caribbean makes use of an elegant manner of showing skeletal warriors in the moonlight, but the interjection of these CGI sequences is perfectly seamless in conjunction with the real actors. For most of the movie, they are shown au naturel, so the brief flights of bony horror are jarring and effective. This is exactly how special effects should be used in a movie as the key word is special, yet lately, lazier directors have used the technology all too constantly. While Pirates of the Caribbean: The Curse of the Black Pearl is never going to be described as breaking new ground in the genre, it will constantly be mentioned in the same breath with the words joyful, festive and entertaining. It’s a movie with a disarming ability to put a smile on your face and leave it there, and I whole-heartedly recommend it.